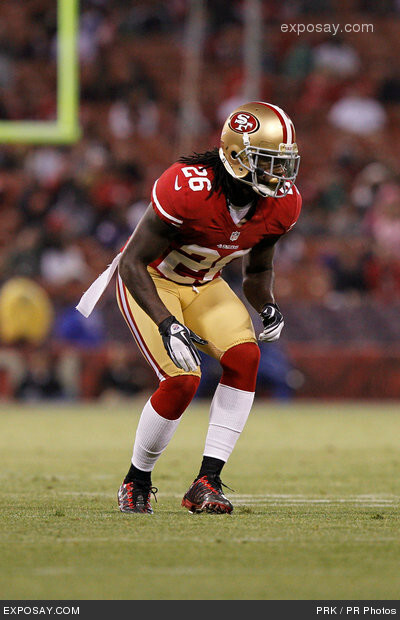 NAIA National Office – Former Belhaven defensive back Tramaine Brock will take the field for the San Francisco 49ers as they take on the Baltimore Ravens in Super Bowl XLVII, becoming the first former Belhaven football player to make it to the super stage of the Super Bowl. A native of Gulfport, Mississippi, Brock is in his third season with the 49ers after finishing his senior season at Belhaven in 2009. Brock has collected a career-high 16 tackles in 16 games this season for San Francisco as a defensive back and member of the special teams. Brock’s total career numbers include 25 tackles, two interceptions, five passes defended, and one forced fumble. 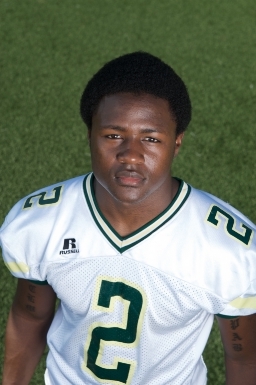 In 2009 as a Blazer, Brock had a team high six interceptions and returned two for touchdowns. Brock tied the Belhaven single season record for most interceptions and compiled 51 total tackles with 2.5 sacks and 13.5 tackles for a loss. Brock also returned kicks for the Blazers averaging 17.4 yards per return with a long of 55 yards. Brock was named to the Mid-South Conference Western Division All-Conference Team. San Francisco will be playing for its sixth Super Bowl title when the team battles the Baltimore Ravens in New Orleans on Sunday, February 3rd. The kickoff is slated for 5:30 PM CST, and the game will be broadcast on CBS. Thanks to JoBeth Petty and the Student Life team for leading such a successful service day project for the campus. Thanks especially to the hundreds of students, faculty, and staff who joined in our annual service day event on MLK Day. In 2000 Tramaine Brock changed out his Belhaven football uniform for one of the San Francisco 49rs. He’s had a great three year career in the NFL thus far. And today, reached a high point with a win over the Atlanta Falcons to earn the opportunity to play in Super Bowl XLVII. He is the second team cornerback playing behind #22 Carlos Rogers, an 8 year veteran of the NFL, and Pro Bowl cornerback. Tramaine wore #1 for us, and wears #26 for San Francisco. He’s easy to find during a game because he is nearly always the fastest player down field to cover kickoffs and punts. Brian McMahon Named Men’s Soccer Coach of the Year! Wow, this is a icing on the cake for this great year in men’s soccer at Belhaven! Congratulations Coach . . . we’re proud of you and proud you’re a Blazer. 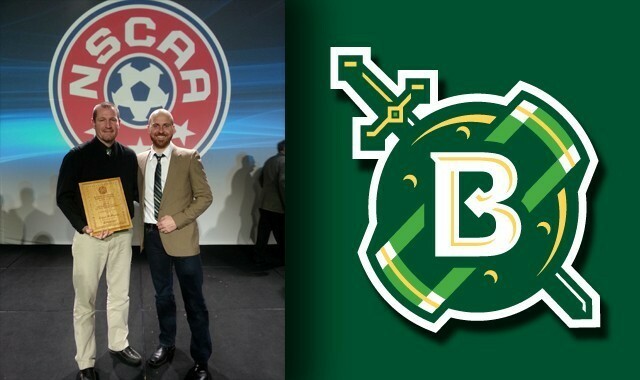 Head Coach Brian McMahon of the Belhaven men’s soccer team has been named the 2012 Field Turf National Soccer Coaches Association of America/NAIA National Coach of Year following a memorable 2012 season. McMahon, who just completed his first season at Belhaven, led the Blazers to the 2012 NAIA National Championship and a 19-4-1 record. The Blazers rode home from Montgomery, Alabama following a 2-0 win over the University of Mobile with the programs second national title and just the third national title of any sport in school history. To make it even more special, this year’s championship took place during the 20th anniversary season of the last national championship team which was the 1992 men’s soccer team. McMahon also coached three Southern States All-Conference players and had two players earn NAIA All-American Honors. Junior forward Will Monsour was an NAIA Third Team All-American while senior defender Tom Cosgrave was an Honorable Mention All-American. The complete list and bios of all the NSCAA National Coaches of the Year can be viewed by clicking here. Today was the funeral for Don Ray, who served as our Vice President for Development from 2000 to 2004, before he went on to pastor a church in Michigan. The family asked me to write a eulogy focused on his fund raising work. I was honored to remember such a great friend in this cause of Christ centered higher education. Don Ray was a broadly gifted friend who had many remarkable chapters and centers of influence in his life – but I had the privilege to work with Don at the pinnacle of his fund raising career. Our connection began just hours before he was to accept a position in Minnesota as Vice President of a Christian University, having had a successful run doing the same work at Millsaps College here in Jackson. I had never met Don, but when I was told on a Friday that Don was announcing a position change on Monday, I called him late that afternoon. And by Sunday afternoon we had such a deep friendship and connection of our fund raising philosophies that he and Jeanie pulled out of the Minnesota announcement and moved across the street instead. That was how Don worked. He trusted his instincts, he built off his vast experience to make solid decisions, and most importantly, he looked to the Lord for guidance and followed God’s leading even when it didn’t always make sense. As a fundraiser, Don loved to dream about connecting good people with a vision for God’s work. Several times a week he would unexpectedly pop into my office, and usually began the conversation saying, “I was just thinking …” and then go on to tell me about a potential friend of the University who needed to become an investor in Christian higher education. He loved to think about how to reach people who didn’t know us, didn’t understand us, and didn’t yet grasp the significance of Christ-centered higher education. He would scan the landscape, looking for people who could change a student’s life by their gifts. And then, we’d set out a course for how to become connected with that person. We talked about so many people during those years. We probably talked about most of you here today and what you ought to give! He even would talk about how to get his family to give to Belhaven University. But for Don, it was never about the money. It was always about what the money did to help a student who couldn’t make it without some assistance. And it was always about how it could light up a giver’s life by allowing them to become part of God’s great design for building His Kingdom. Together, we raised a lot of money. We sweated through some times when it seemed impossible. And rejoiced when we could see God do the impossible. During his four years at Belhaven our development office grew into maturity for the first time in our 120-year history. Don Ray led us there. He gave students hope by raising scholarships. He gave faculty tools to transform lives. He gave me encouragement in the journey. He gave Belhaven so much – including giving us a remarkable son-in-law architect who took the funds we raised, and put a permanent stamp on Belhaven that will last for generations. Most importantly, he gave his life to God by raising gifts to help students who would never say thank you, because they didn’t even know who was working so hard on their behalf. So often in our Christian life we have become lazy by projecting what we think Jesus would do in a situation, rather than studying exactly what he did and then following his example. I walked through parts of Mark chapters 1 and 2 to show how this concept works as we study the scripture asking this question. I’ve had several people ask me for the five points of that message and the scriptures from Mark. They are below contrasting our ASSUMPTION of what Jesus might do, with what Jesus ACTUALLY DID. Jon Whittington – Also yesterday, one of our longest serving faculty members died, Jon Whittington. Below is the story from the Clarion Ledger. Jon brought our art department to national distinction, and his influence on students was vast during the 24 years he taught at Belhaven. Longtime art professor Jon Whittington died in his sleep Saturday of natural causes at his Jackson home. He was 74. Visitation is 9-11 a.m. Wednesday with a memorial at 11 a.m. at Wright & Ferguson Funeral Home in Jackson. Whittington was art professor and art department chairman at East Mississippi Community College, Belhaven University (then Belhaven College, his alma mater) and Antonelli College. Former students recalled Whittington as a magnetic, knowledgeable mentor whose impromptu art discussions in the hallway at Belhaven became a longstanding ritual and whose influence on the local art community is still felt. “I know he’s touched many lives,” said Gretchen Haien, a Jackson photographer and associate professor of art at Belhaven University, who was also a former student of his. He allowed her to help teach and provided an opportunity for independent work; he connected skill and opportunity for his students. “He was a very unassuming person, very shy with his work and very generous with his teaching,” Waters said. Carl Coleman, a former student and now full-time artist in Santa Rosa Beach, Fla., said, “He was my mentor, he was my surrogate father, he was my best friend. Our former Vice President for Development, Don Ray, suffered a severe stroke over the weekend. He served with us from 2000 through 2004. He has had significant heart and brain damage and is not able to speak or walk. The first time I saw him in the hospital after he was moved out of intensive care, he was responsive when I talked about our work together. He smiled when I teased him about getting out of bed to come help raise money to build one more building. And I could see that twinkle in his eye when I talked to him about how much we need him to get well so that he can help thousands more students through the gifts he’s raised for Belhaven. Last night he was quieter when I saw him, but still reached for my hand and we prayed together again. Today the family is moving him from St. Dominic’s hospital to hospice care at The Home Place. Don, his wife Jeanie, and the family need our prayers.